The new Echo Spot was first announced back at the end of September, along with a host of related Echo devices like the Echo Plus, Echo Buttons, and Fire TV 4K. At the time, all you could do was place a pre-order. 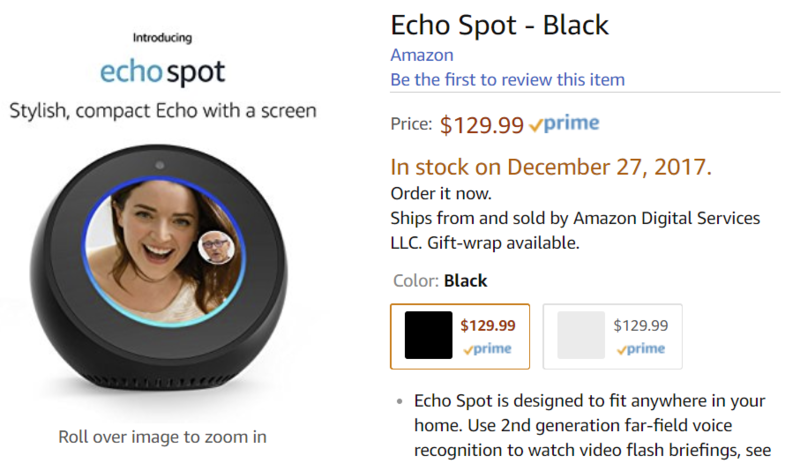 But today is the official release, and although the Echo Spot is now formally available for $129.99, it's already backordered until well after Christmas. Reviews for Amazon's new device started landing yesterday. Ostensibly an Alexa-powered smart alarm clock—according to the majority of recent reviews—the Echo Spot is a smaller version of Amazon's Echo Show. It's a compact device with a speaker, round 2.5" screen, front-facing camera, 4-microphone array, and full integration into Amazon's Alexa ecosystem. That means, just like the vast majority of Amazon's other Echo devices, you can use it to control all the hardware in your smart home or integrate via "skills" with other apps and services. As a couple of reviews have already noted, the idea of having an always-on internet connected device on your bedstand might be sketchy enough by itself, but add in the fact that it's got a camera, and not everyone will enjoy the idea. Of course, Amazon isn't actually advertising the Echo Spot as an alarm clock, but most reviews seem to be pointing the device's utilities in that direction. There are plenty of use-cases for it outside the bedroom, though. Although it was released today, Amazon seems to have run out of stock, with orders placed now set to ship next week. At the time of writing, the black model is set to be in stock on December 27th, and the white version won't be available again until January 5th. If you were hoping to pick one up for the holidays and you didn't place a pre-order, you're probably out of luck. However, should you absolutely need something by then, the Echo Show is currently on sale for $149 and should arrive before Christmas.